Most of the insurance is ‘Motor Insurance’ – the bread and butter of most Insurer (should we say curd rice !]. This business was for long tariffed, now in chaos in the name of discounts and newer add-on coverages. There are two types of policies - Package policy (called Comprehensive) and Liability only Policy. The Liability policy covers the Third party liability for bodily injury and/or death and property damage. Tanker lorries are covered under Motor Policies and what is the exposure – is it the lorry (own damage), the cargo that is carried inside, or the death / injury to third parties that they may cause arising out of an accident ? I had earlier posted in great detail about the Apex Court Judgement - the cause of action arose, in the early hours of October 29, 1987 - a petrol tanker was proceeding on National Highway 4, coming from the Pune side and going towards Bangalore. As it reached near village Kavathe, in the district of Satara, Maharashtra, another truck laden with onions, was coming from the opposite direction. At the point where the two vehicles crossed each other, there was a pile of rubble on the left side of the road. As the two vehicles crossed each other, the rear right side of the petrol tanker was hit by the rear left side of the truck. As a result of the impact, the petrol tanker was thrown off the road and it came to rest on its left side/ cleaner's side on the kutcha ground, about 5 feet below the road. As a result of the collision and the falling down of the petrol tanker on its side, petrol started leaking from the tanker. The tanker driver was unable to stop the leak even though he tried to tighten the lid. At daybreak, the local people started collecting near the fallen down tanker and some of them brought cans and tried to collect the petrol leaking out from the tanker. The driver of the tanker tried to stop them from collecting petrol or even going near the tanker, explaining to them that doing so would be risky and dangerous. No one, however, listened to him and he was even manhandled. In the melee, the petrol caught fire and there was a big explosion in which 46 persons lost their lives. The heirs and legal representatives of those people who died at the accident site filed claim petitions for compensation under section 110A of the Motor Vehicles Act, 1939 before the MACT, Satara, against the owner of the petrol tanker and its insurer. In all the cases, claims were also made for payment of Rs.15,000/- as no fault compensation under section 92A of the Act. From MACT to High Court and thence to Supreme Court, the case was appealed. One important Q was - when the tanker was lying immobile, was that a petrol tanker still, even if it be assumed that it was a motor vehicle, was in use as a motor vehicle at the time of the explosion and fire. The Apex Court having considered all details of the case held and observed that : - In our view, in the facts and circumstances of the present case, this question must be answered in the affirmative. That the learned Judges of the High Court have rightly concluded that the collision between the tanker and the other vehicle which had occurred earlier and the escape of petrol from the tanker which ultimately resulted in the explosion and fire were not unconnected but related events and merely because there was interval of about four to four and half hours between the said collision and the explosion and fire in the tanker, it cannot be necessarily inferred that there was no causal relation between explosion and fire. The vehicle owner and the Insurer were held liable for the death / bodily injury to persons arising out of explosion after hours of the accident. Chaos, killings and people losing lives in Pakistan is nothing new ~ yet this tragedy reported in all media is bad. More than 150 people were reported killed and around 140 injured in a fire that broke out after an oil tanker overturned in central Pakistan and crowds rushed to collect the fuel. The tragedy came one day before Pakistan was due to begin Eid ul-Fitr celebrations, with many roads crowded as people travel home for the holidays. Images of the crash showed rising flames and a thick plume of smoke, along with charred vehicles. Many of the victims, who were taken to Bahawalpur's Victoria Hospital in south Punjab, suffered up to 80 per cent burns. The hospital declared a state of emergency, called in extra doctors and nurses, and formed a team to handle the emergency within 15 minutes of the fire. Prime Minister Nawaz Sharif expressed his grief and directed the government of Punjab province, run by his brother Shabhaz Sharif, to provide 'full medical assistance'. The tanker flipped over on the national highway about 60 miles southwest of Multan. It was driving from the southern port city of Karachi to Lahore, the Punjab provincial capital, when the driver lost control and crashed. That was a regular road accident, what followed was not ! 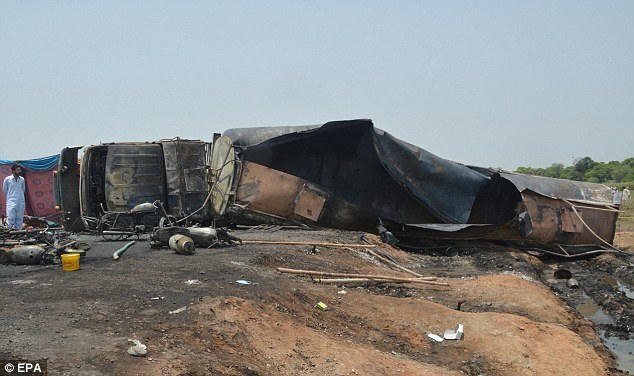 - nearby villagers ran toward the overturned tanker with jerrycans and utensils to take the leaking fuel; and it is reported that some of them were smoking cigarettes, which caused the blaze. A loudspeaker atop a local mosque alerted villagers to the leaking fuel, and scores raced to the site with jerrycans, said Rana Mohammad Salim, deputy commissioner of Bahawalpur. Highway police moved quickly to redirect traffic but could not stop those who raced to collect the fuel, said a spokesman. 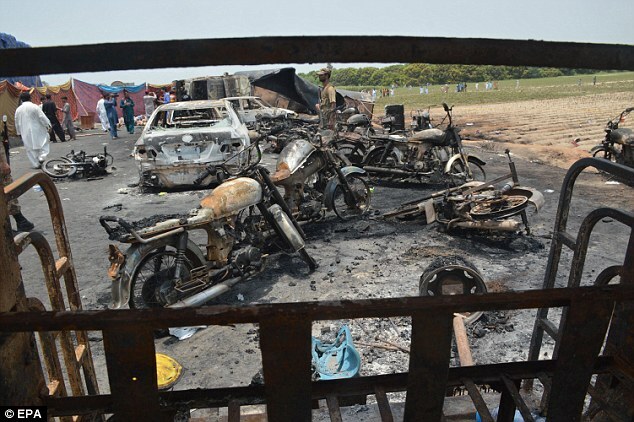 Eyewitnesses said about 30 motorcycles that had carried villagers to the accident site lay in charred ruins nearby. Eight other vehicles were destroyed, they said. Pakistan has an appalling record of fatal traffic accidents due to poor roads, badly maintained vehicles and reckless driving. At least 62 people including women and children were killed in southern Pakistan in 2015 when their bus collided with an oil tanker, starting a fierce blaze that left victims burnt beyond recognition. The country has also long struggled to contain a chronic energy crisis, with regular blackouts suffocating industry and exacerbating anger against the government. The crash came days after a series of militant attacks killed at least 57 people across the country Friday, unnerving many Pakistanis, with authorities ordering a security crackdown. Sad so many lives have been lost in an incident, which could have been averted !